USD’s Professional and Continuing Education offers results-orientated, targeted programs designed especially for busy working people. You will develop critical workplace knowledge, skills and tools that you can apply immediately! Start building your competitive edge today! A certificate is a rigorous program of study that demonstrates a progression of learning and the mastery of a specific body of knowledge. 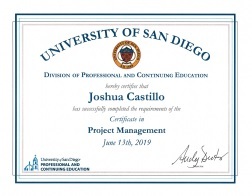 Certificates at USD are a minimum of 8 semester units of coursework, and have gone through extensive community reviews, curricular oversight, and university approvals before they are offered for continuing education or professional development. Unless otherwise stated, you have five years after payment of the certificate fee to complete your certificate program requirements. Payment of the certificate fee is easily done during the checkout process. Each time you add a course to the cart that is part of a certificate program, you will find that the Certificate Fee is available. If you are also planning to complete a certificate, simply check the box next to the certificate fee to add it when enrolling in one or more of the courses, click Re-Calculate, then Continue Checkout. Only add the Certificate Fee one time. Please contact us with any questions or for more information on certificate program. NOTE: The use of the term certificate does not apply to a "teaching or administrative credential" that gives license to teaching within a given state.